She'll adore breaking through to the soft, savoury centre wrapped in a crunchy shell. 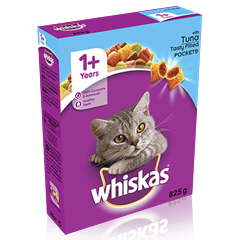 Whiskas® Temptations are irresistible treats for your cat, foil packed for freshness and come in a variety of delicious flavours. Temptations are less than 2 calories per piece. 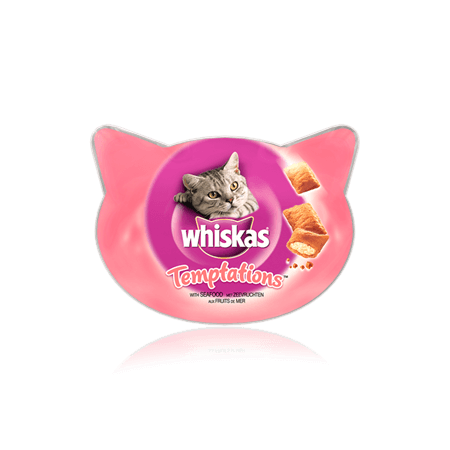 WHISKAS ® Temptations TM with Seafood 60g is rated 4.9 out of 5 by 31. 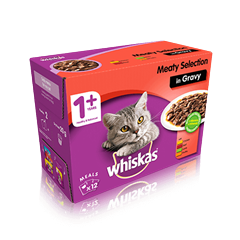 Rated 5 out of 5 by JackieBlue from Very crunchy My cat loves to have a few ‘temptations’ sprinkled onto his dinner- they are super crunchy and so I think that’s why they are his favourite! Rated 5 out of 5 by Anonymous from My cat loves them! Honestly have never seen him move so fast! Soon as I opened the packet he darted in. He enjoyed them very much and even tried to help himself to them. Rated 5 out of 5 by sunnicat from Sunni loves Whiskas' temptations. I used to buy Dreamies, but my cat Sunni did not always eat them, but he loves Whiska's temptations, he will sit and stare at me when I am watching telly until I give in and go to the kitchen to give him some. He eats them out of my hand before I have time to put them in his bowl. Makes a change from the stranger things he eats. 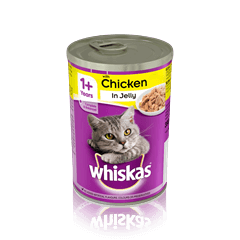 Thank you Whiska's - Happy cat = Happy owner. Rated 5 out of 5 by Anonymous from always back for more This is a treat i buy my cat every week and by doing these reviews i have seen there is other sorts i have not tried so will be looking out for them. if my cat had his way he would eat them all in one go . Vegetable Protein Extracts, Cereals, Oils and Fats, Meaty and Animal Derivatives, Minerals, Fish and Fish Derivatives (including 2.5% Salmon), Molluscs and Crustaceans (including 1.5% Prawns), Milk and Milk Derivatives, Additives: Antioxidants, Colourants. Make sure you don't give your kitten Whiskas® Temptations until she's finished being weaned.